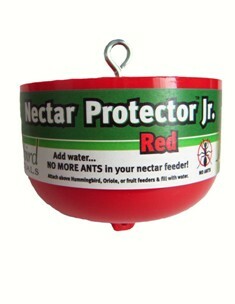 Home > Store > Hummingbird Feeders > Red Nectar Protector Jr. Protect Oriole, Hummingbird, fruit, and butterfly feeders from ants Simply hang above the feeder and fill with water - ants can’t swim! Easy to clean concave bowl. Less maintenance than most ant-moats! Extremely strong - Holds even the largest feeders! Comes with "S" hook, fits all nectar feeders - even decorative feeders. Measures: 3.5" wide and 2.5" deep. This is an ant deterrent similar to the size of others on the market, but this holds TWICE as much water so you don't have to refill as often.